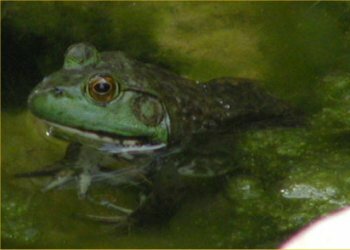 A large male bullfrog in my 1800 gallon pond on 7/5/02. 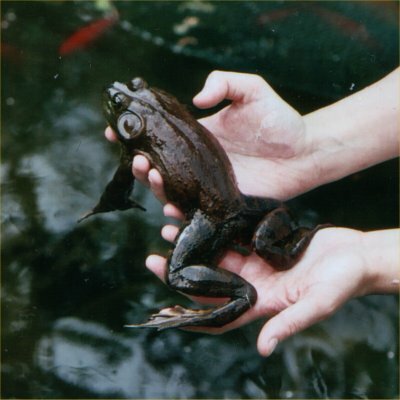 Rana catesbeiana , the bullfrog, is the largest frog in the United States. 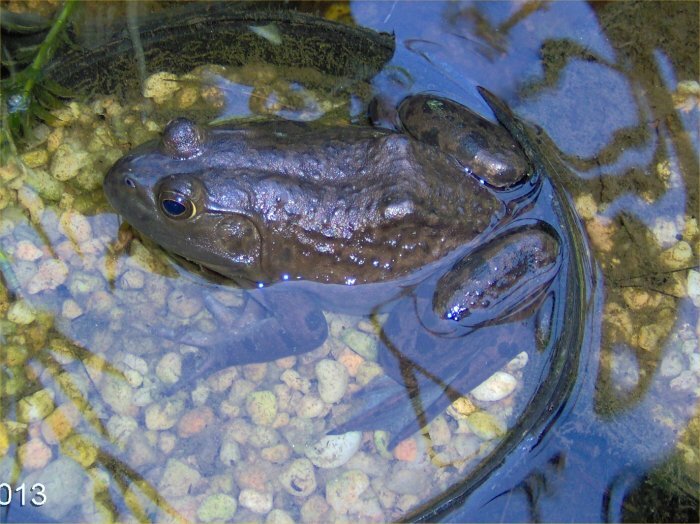 They are often suggested as a species to add to ponds because they eat algae. 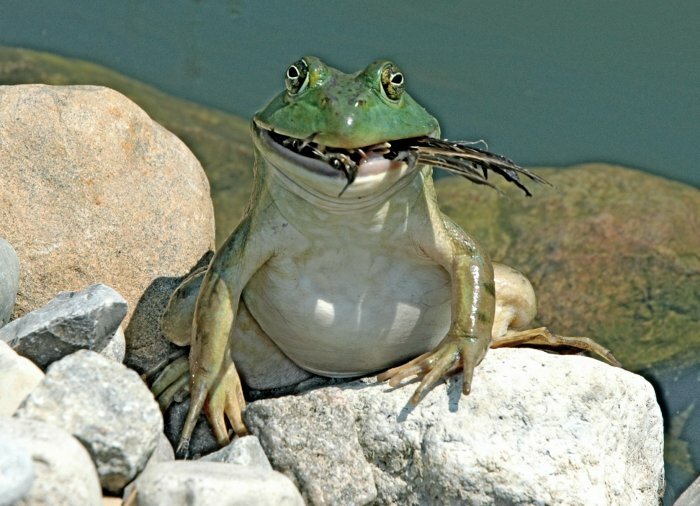 Yes, the tadpoles eat algae and other plant foods for two years while they develop but the adults eat whatever they can fit in their large mouths! They are ambush predators. That means, you may notice tadpoles, frogs, fish, insects, crustaceans, snakes, bats, small birds, etc. vanishing. 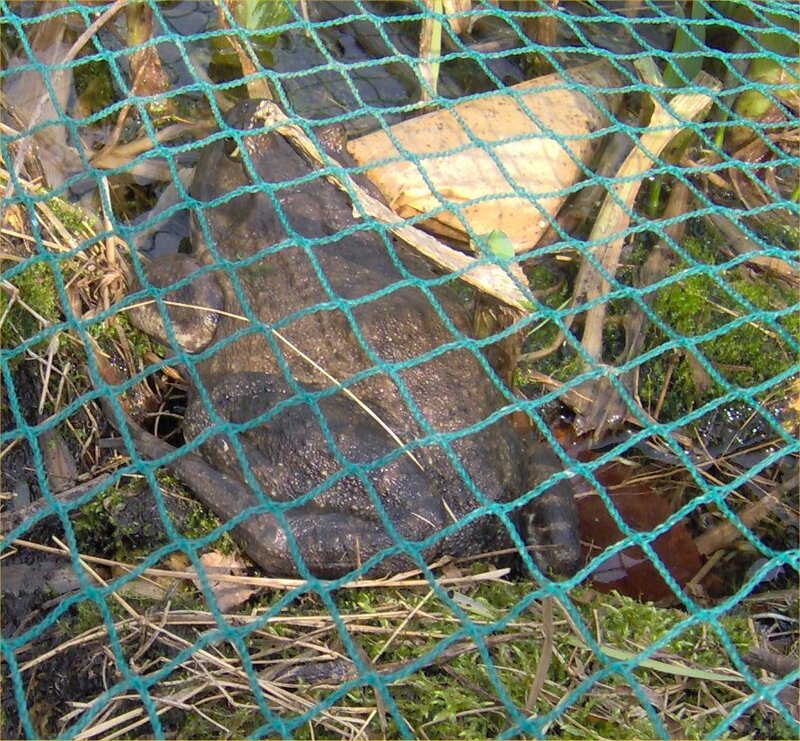 I would not suggest these frogs for small fish ponds. 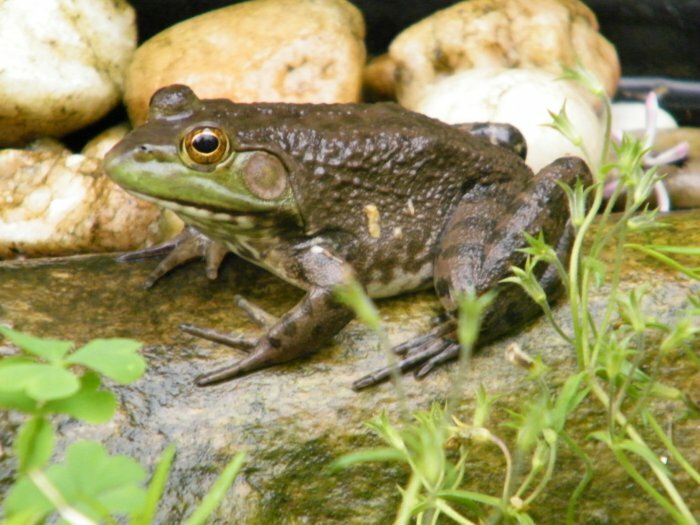 Bullfrogs can grow to 8 inches long but may range from about 4 to 8 inches. The male's call is a deep "jug-a-rum." Bullfrogs are supposed to be nocturnal. 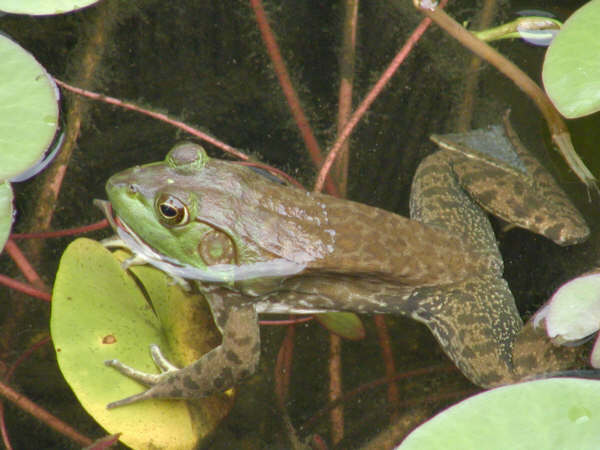 While the bullfrogs I have mostly call at night, they are also active feeding on insects during the day. I did not add any to my pond at first but they did show up including a huge male that stuck around for a few years. They are twice as big as the green frogs and look very fat. I wonder who they ate? 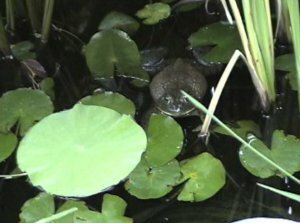 Starting around 2008, I started putting in just a few bullfrog tadpoles each spring to help with the pond. One became an adult female. Males have ear drums larger than their eye while females' drums are the size of their eye or smaller. The males' ear drums touch their eyes. 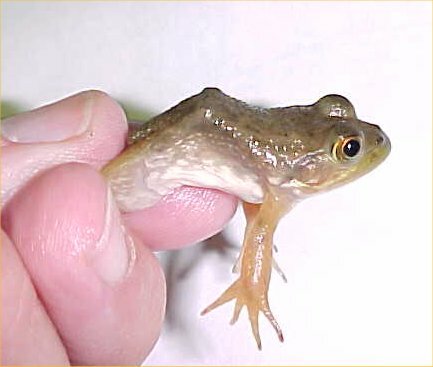 Also, during breeding season, the male bullfrog has a bright yellow throat unlike the female's white throat. His call is described as "jug-o-rum." Males will wrestle for territory. In the summer, a female can lay up to 20,000 eggs at one time! Eggs hatch in about 4 to 8 days depending on temperature. 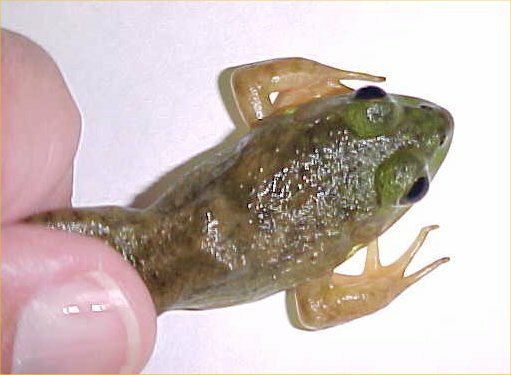 Bullfrog tadpoles feed on algae and whatever plant and animal materials are around. If they are starving, they will eat each other. 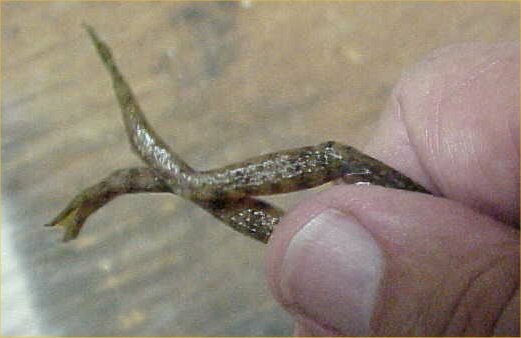 In an aquarium setting, they can be fed most fish foods and even Cheerios. 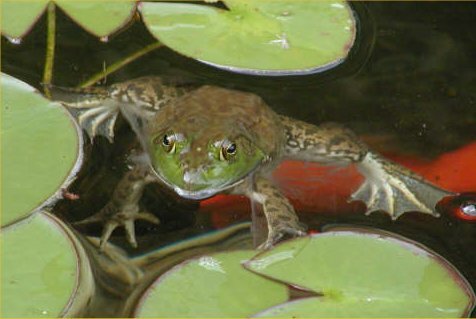 Bullfrogs take 2 to 3 years before they leave the water as adults (usually two years). At that point, it is at least a few more years before they can breed themselves. 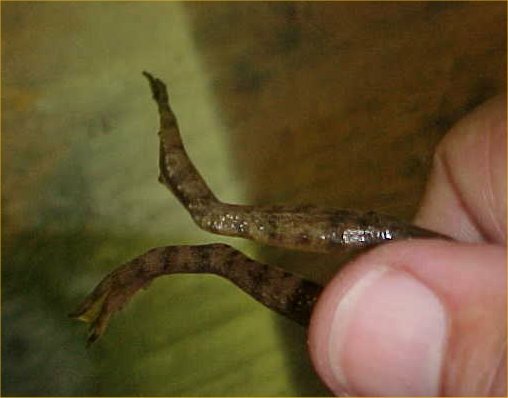 Both eggs and tadpoles taste bad to predators. 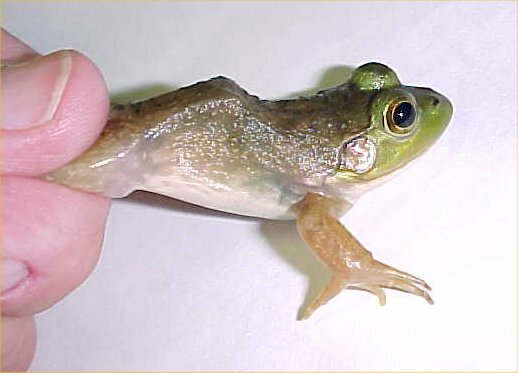 The bullfrog tadpole is said to have a ridge of skin that runs from behind the eye to over the eardrum and ending at the base of the front legs. Other tadpoles do not have this ridge. 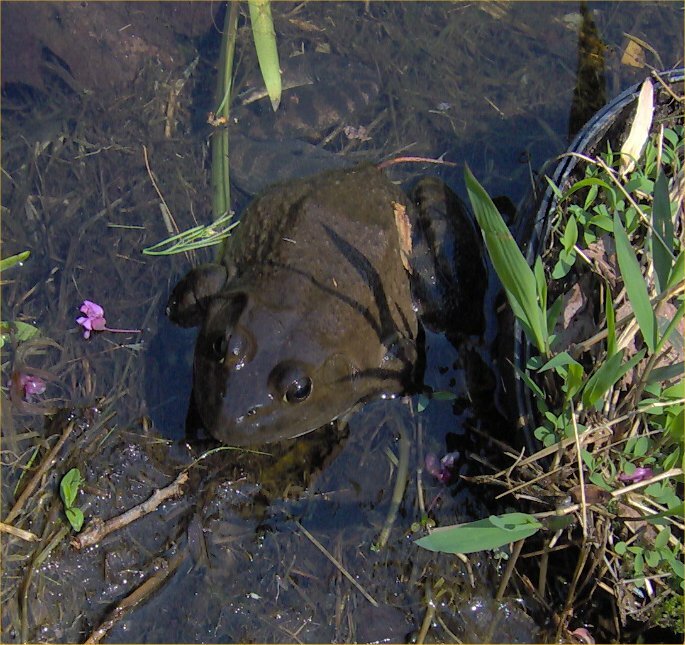 Bullfrogs like warm, shallow, still, highly vegetated waters. 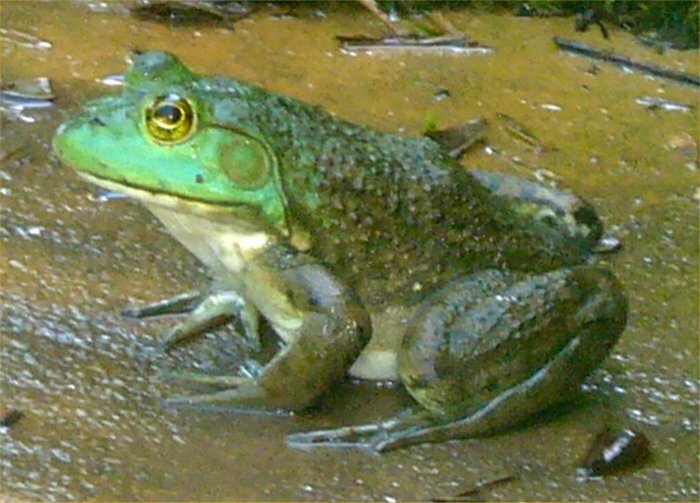 I had read about male bullfrogs fighting but had never seen it until 5/19/05. I was laying low around the pond, working on weeding to mulch so I was pretty quiet and out of sight. At least 3 male bullfrogs and 2 male green frogs started calling. After a while, I heard a lot of splashing. I looked up over the hill to see two male bullfrogs fighting. They would rear up showing off their bright yellow throat pouches which they inflated. They would call and then lunge at each other, slamming their bodies together and flapping each other with their front legs. It was quite intense and interesting to see. 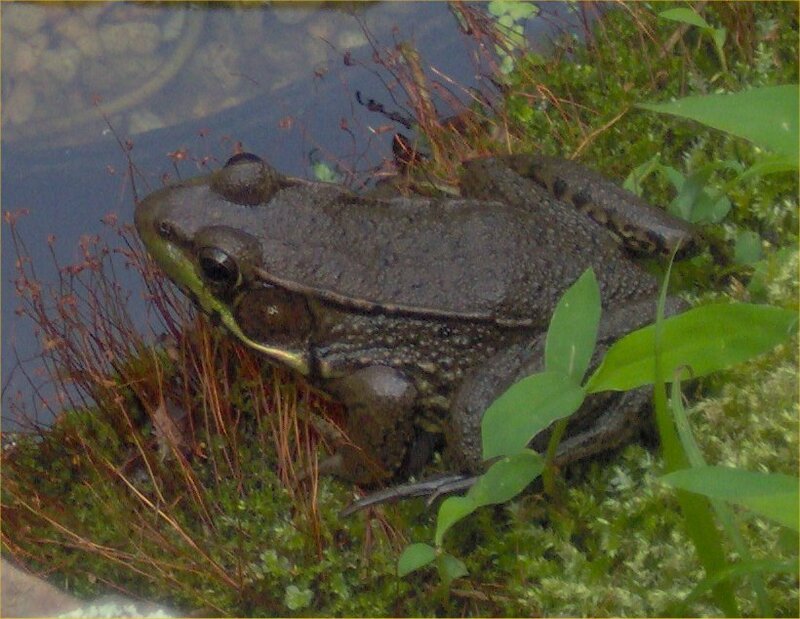 Unfortunately, due to both the frog-eating and pond-keeping contingents of people, sometimes bullfrogs are released or escape into areas where they are not native. 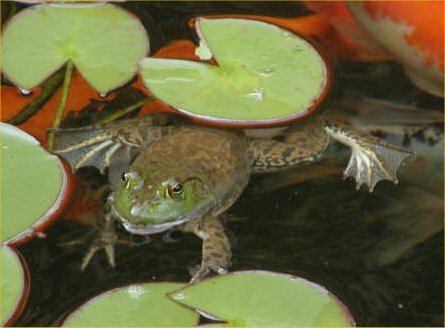 With their large appetites, bullfrogs can eat native frogs and fish and even birds, sometimes eliminating them entirely. 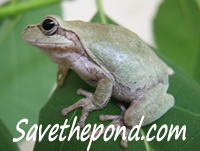 Never release any non-native animal into your pond that is able to leave your pond. In a closed system (no streams or water in or out), this would include any animal that is not 100% aquatic. Of course, even non-native fish, snails, etc. 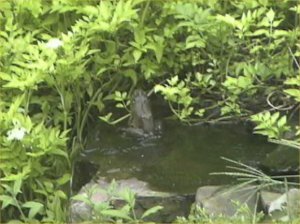 could get into the wild if the pond overflowed into a natural pond or stream. After the great floods on the Mississippi in the early 2000's, many a big, expensive koi was lost to the wilds. I have never tried to catch a bullfrog. I can easily catch my green frogs, sometimes even by hand, but otherwise by net. My bullfrogs hide most of the time and come out at night but jump in if I even open the door to outside. Other people have bullfrogs that are less shy. 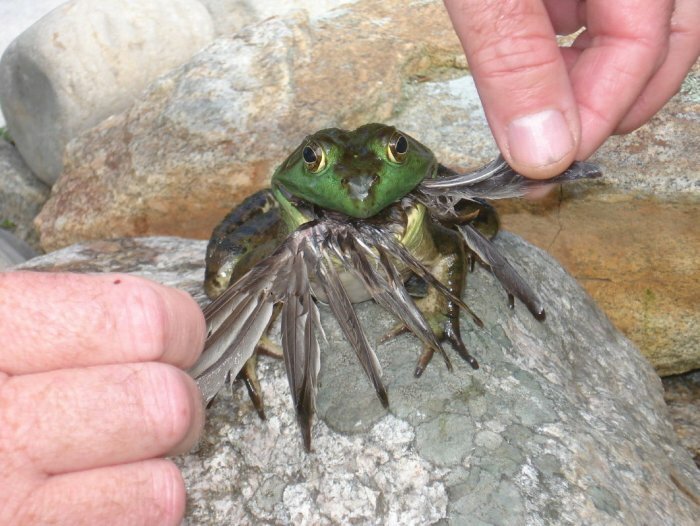 I would later have a female bullfrog who ignored me unless I touched her. Darlene recommended this procedure she has used to catch some bullfrogs: "Use a headlamp, (or get a friend with a flashlight) and after dark, listen for them. When you finally find where they are, shine the light on them, and slowly slip a lingerie bag over the frog. I found this is a simple way, since the light seemed to mesmerize the frogs. Mine were always on my pond shelves, but I could see them under the water, and would hold the open bag in front of them and give them a budge on their butts. They would hop right into the bag. Hope this helps if you ever need to round any up." Bullfrogs showed up in my pond in the summer of 1998. They were very skittish and never let me see them while outside (I could sometimes see them through the window inside). A male began to call loudly in 1999 but we could only catch a glimpse of him. Finally, in July of 1999, they came out of hiding. Beginning on 8/1/99, I could see that a male and two females were ruling the pond as king and queens. The male had a dark yellow throat, large ear drums, and was bigger than the females. He swam up to them, floating on the water and skimming on lily pads, and inflated his throat to make his "blahhhhh" sound. She did not look impressed. 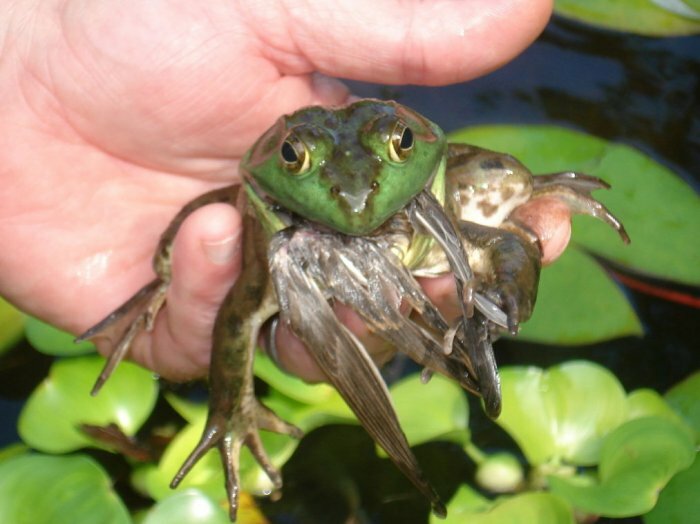 These bullfrogs got a large portion of their diet from butterflies. I watched one eat a tiger swallowtail and the blue capensis lily flower along with it. 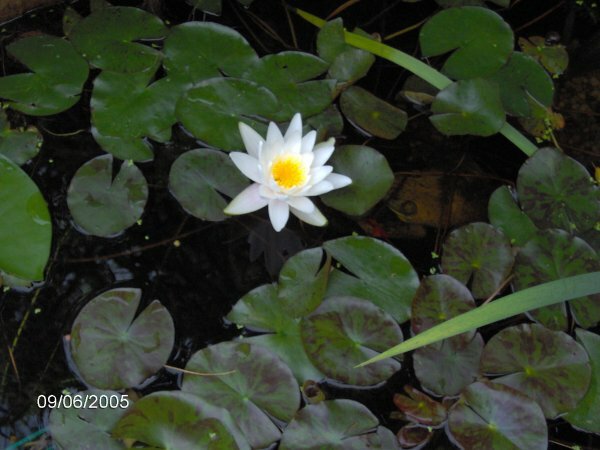 There were butterfly wing pieces and torn lily flowers all over the pond surface. I guessed I would have to live with it because these guys were un-catchable. The poor green frogs ruled the other small ponds. The bullfrogs probably ate the small green frogs and some minnows along with the poor butterflies. 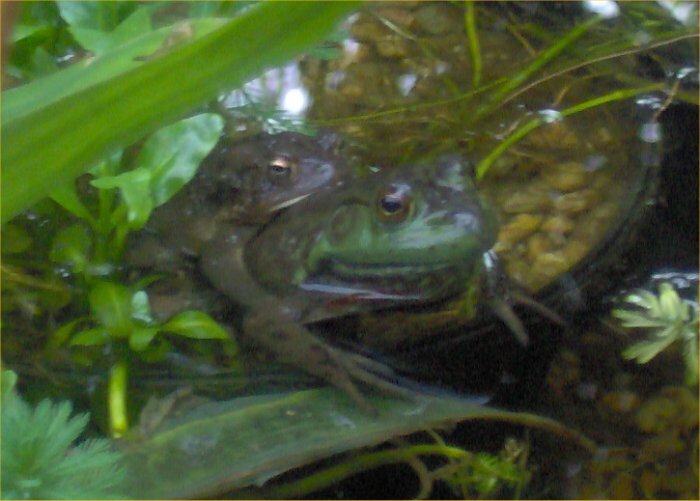 While lions are the kings and queens of the African savannah, eating whatever they choose that is small enough, so too the bullfrogs were the kings and queens of my pond. The adults left in 2000 (the coolest and wettest summer in over 100 years) but some newly metamorphosed babies showed up. 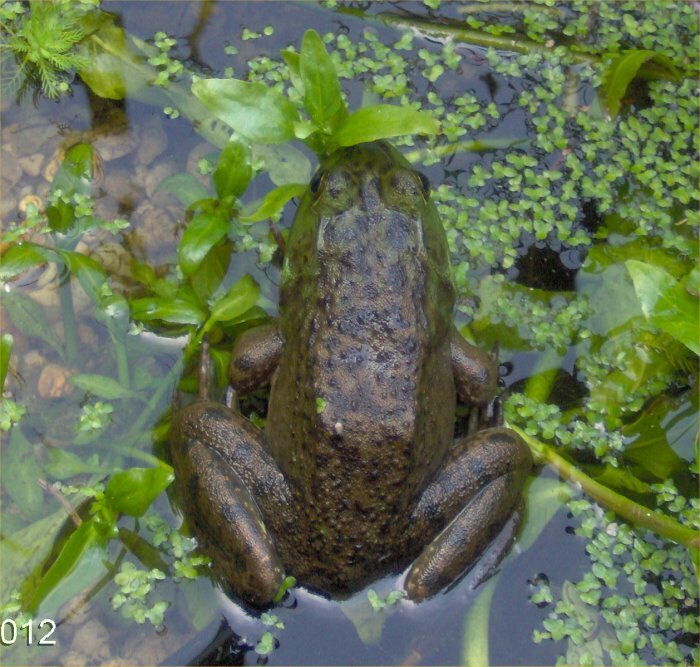 In 2002, the pond became the property of one mega-large male bullfrog whose picture is below. 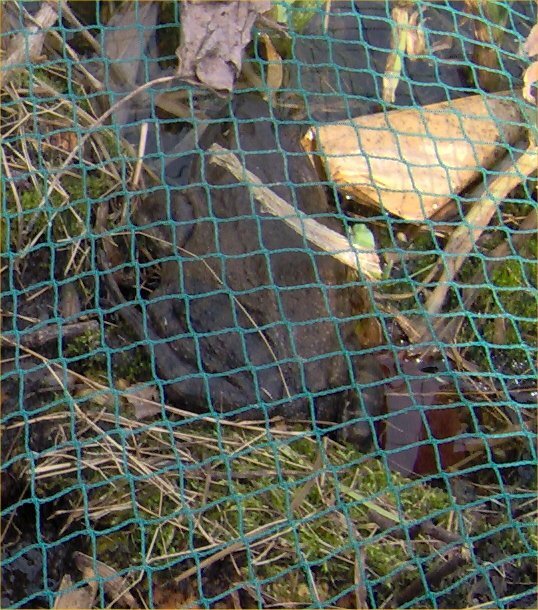 In 2003, he was back (he overwintered in my pump basket), and at least one or two other ones showed up too to join him. 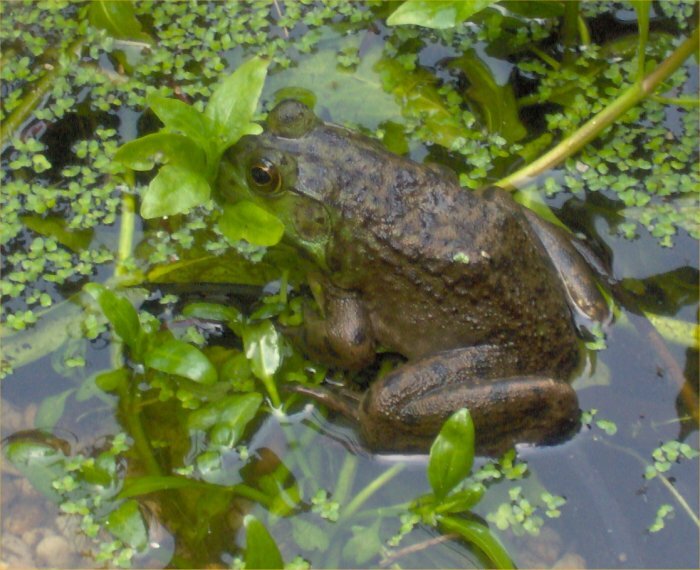 By 2007, I had not seen any bullfrogs much in the last few years. 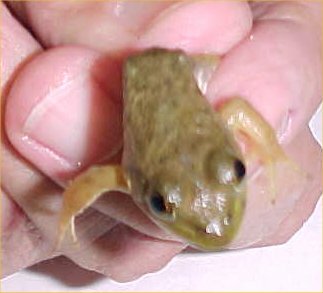 My mother bought me a single 3.5 inch bullfrog tadpole that I put into my 1800 gallon pond on 5/11/07. 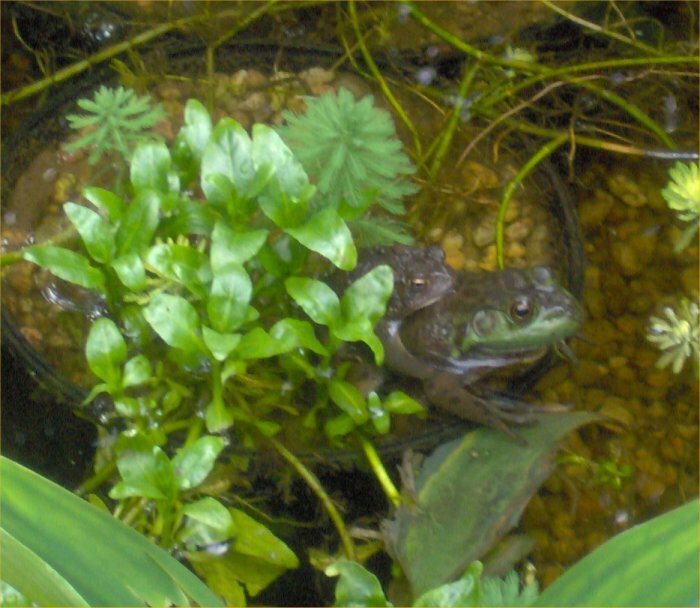 In 2008 and 2009, I added two bullfrog tadpoles each year. I last saw the big male in 2008 or so. 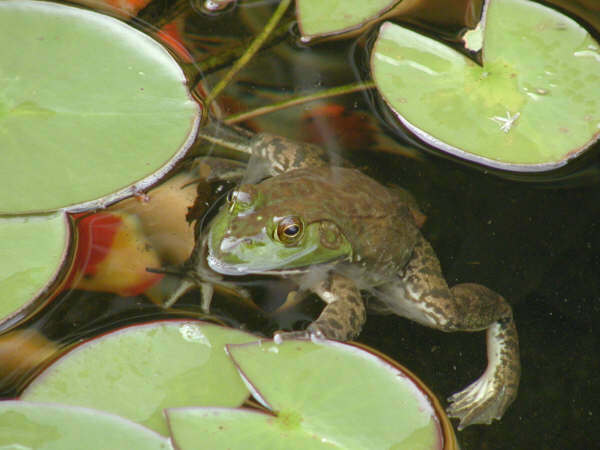 In 2009, a female bullfrog took up residence, and by 2010, she was the queen of the pond. I have not seen any males in 2010. 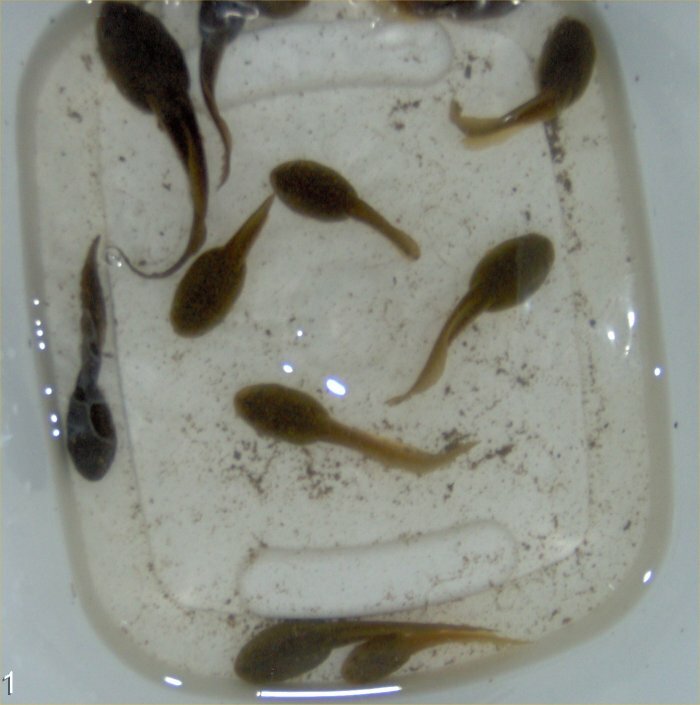 I added six bullfrog tadpoles from the pond store in 2010. 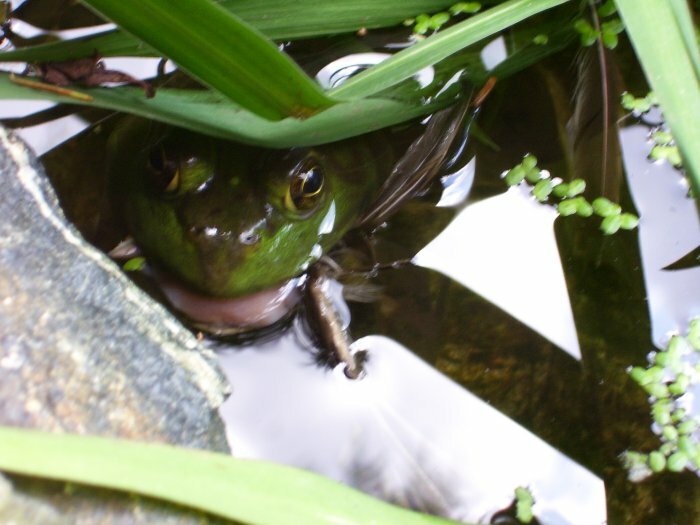 In March of 2011, I discovered that my huge female bullfrog was hanging out under the lip of the biofilter! She held the liner down so that more water was being lost between the liner and the filter but I left her alone. Photos are listed newest to oldest. 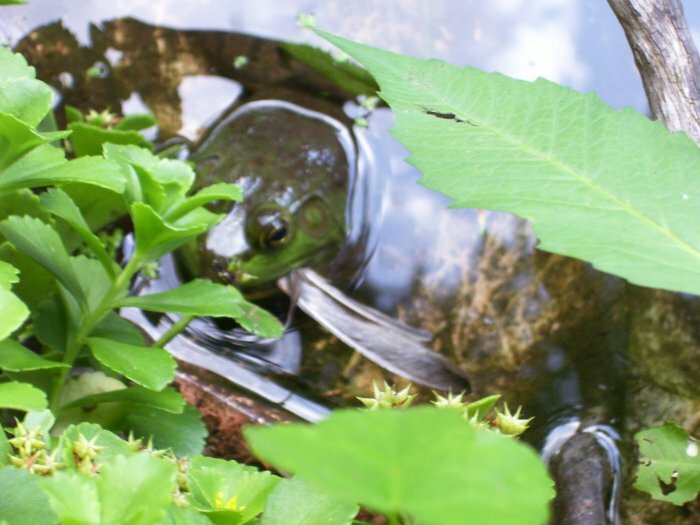 Female bullfrog in a pot in my 1800 gallon pond on 6/4/13. Bulltoad - a male American toad amplexing a female bullfrog! Sometimes, they get confused! Bulltoad - a male American toad amplexing a female bullfrog, close-up! Young bullfrog - notice how the bullfrog lacks the lines down the body that the green frog has in this photo from the same day. Bullfrog tadpoles - tadpoles that I got on 4/28/11; note that one is missing a tail. 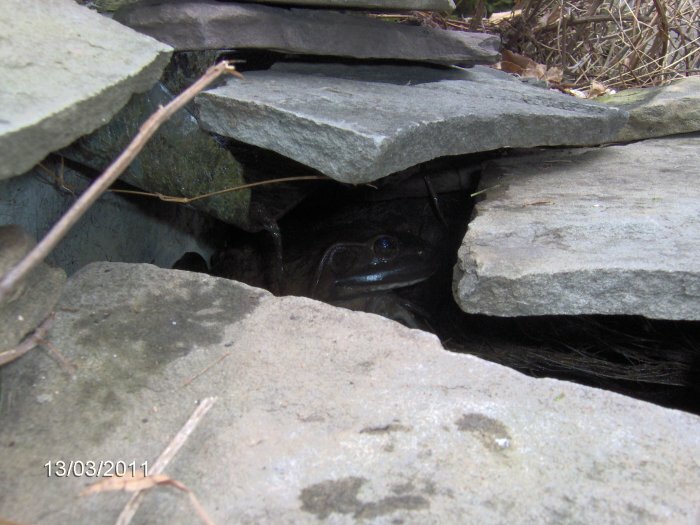 Female bullfrog hiding under where the water comes out of the biofilter on 3/13/11. The hill has collapsed almost a foot under the lip of the biofilter. 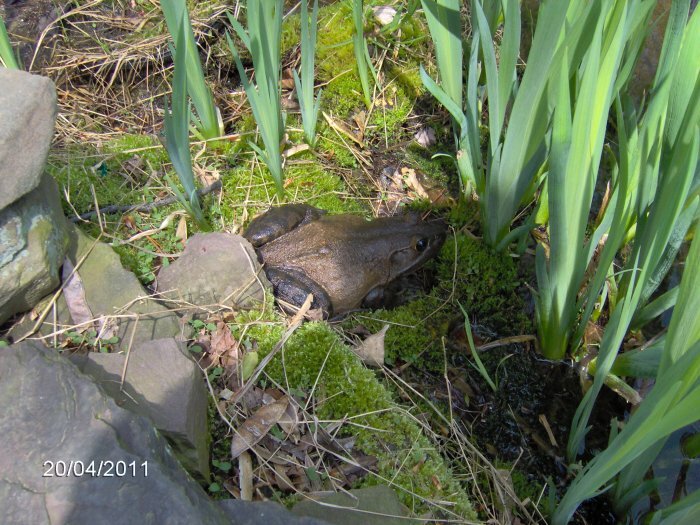 Female bullfrog in my pond on 4/11/10. Bullfrog - close-up from two photos before. 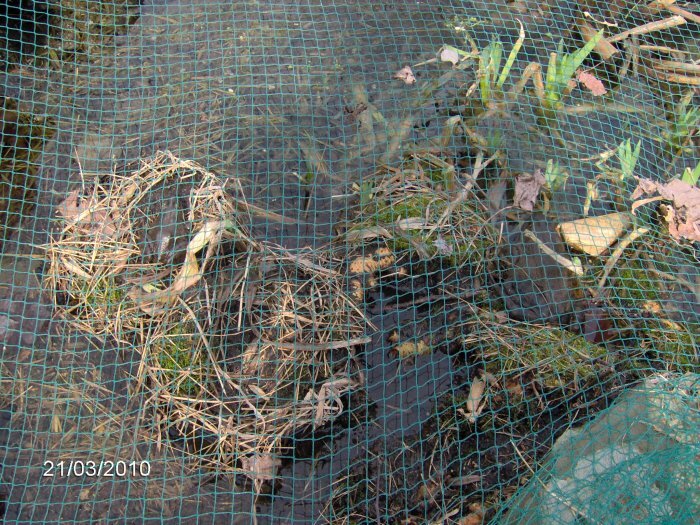 From the 153 gallon pond cleaning on 4/1/08. 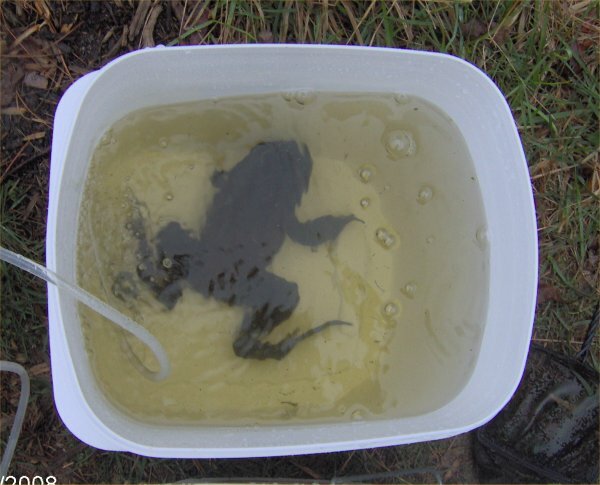 Huge male bullfrog sitting in a cat litter bucket while I clean the pond. He fills up the entire bucket! 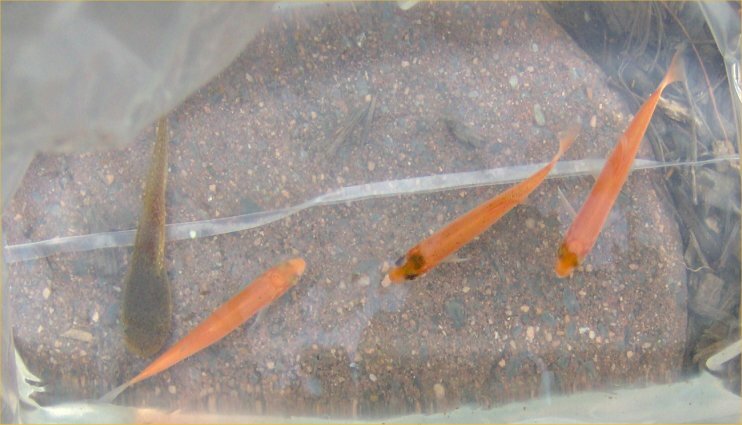 Three new orfe and bullfrog tadpole (view above the bag) on 5/11/07 before release. 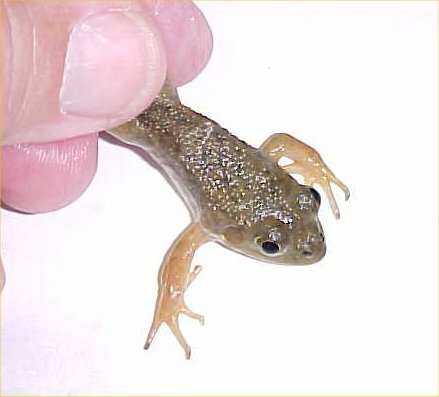 On 6/19/05, I pulled a poor male bullfrog out of my submerged plant protector. I do not know how long he was down there but he suffered from it (lack of atmospheric oxygen) and took on the classic dark colors common during hibernation. You can see a top view and bottom view of him as I held him. He was pretty limp and weak. 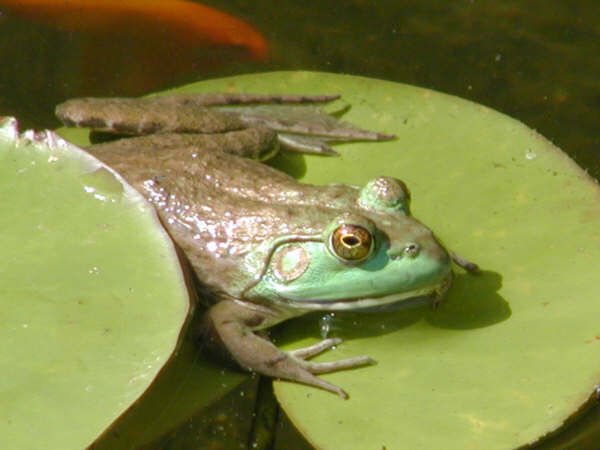 Male bullfrog hiding next to an Albata lily flower in my 153 gallon pond on 6/9/05. 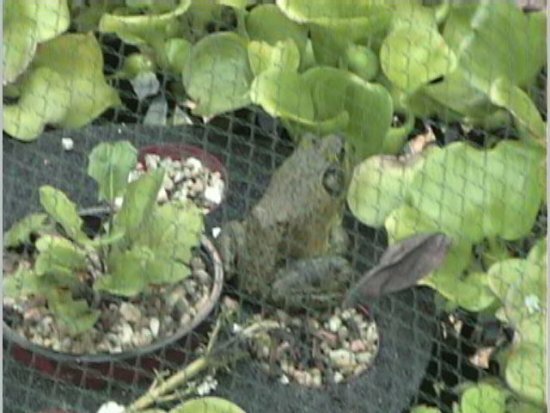 Male bullfrog on my floating terrestrial plant holder under the net (to keep out the heron) on 8/9/04. 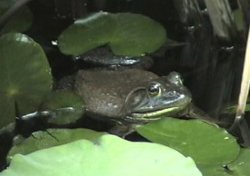 Bullfrog in waterfall in my 1800 gallon pond on 8/16/03. These three photos are of the same male bullfrog and taken around the same time. 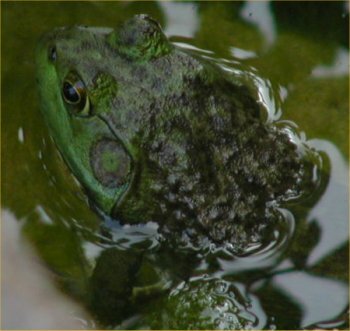 Bullfrog head closeup, huge male, in the shallows of 1800 gallon pond on 7/5/02. He is saying to you, "I will eat you!" 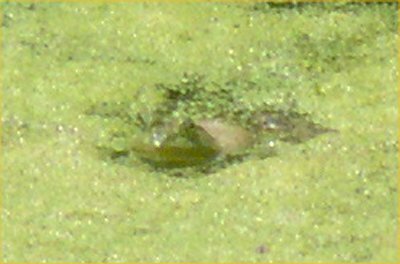 Bullfrog from a distance to show relative size, male, in 1800 gallon pond, 7/5/02. Bullfrog entire body closeup of huge male, 1800 gallon pond, 7/5/02. Yes, this is the same photo that is at the top of the page. Ok, you have read this far, then you are not going to believe this photo! 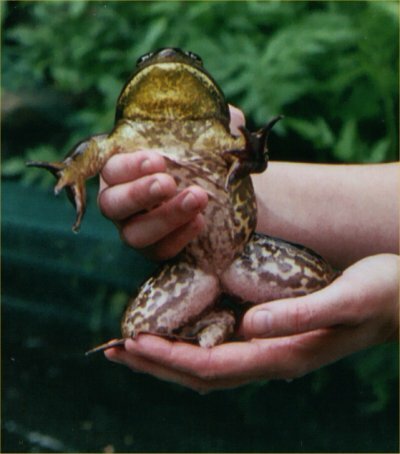 Susan sent me this photo in the summer of 2003 of her bullfrog. The frog has a songbird in its mouth. It is a bit gory so it is a clickable link. 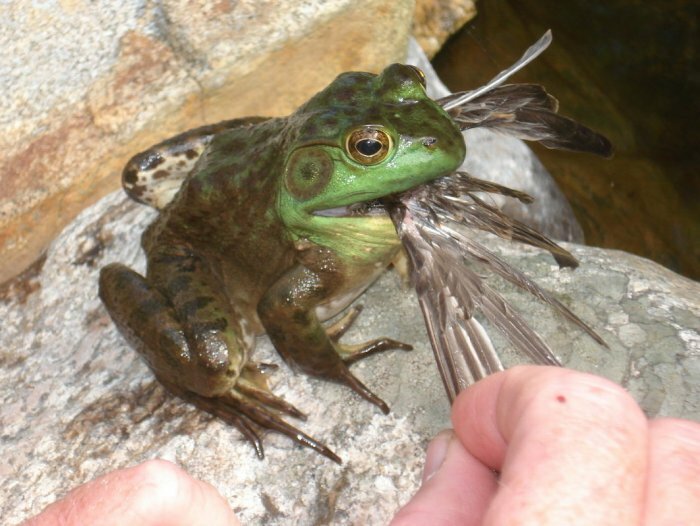 Bullfrogs do eat birds! 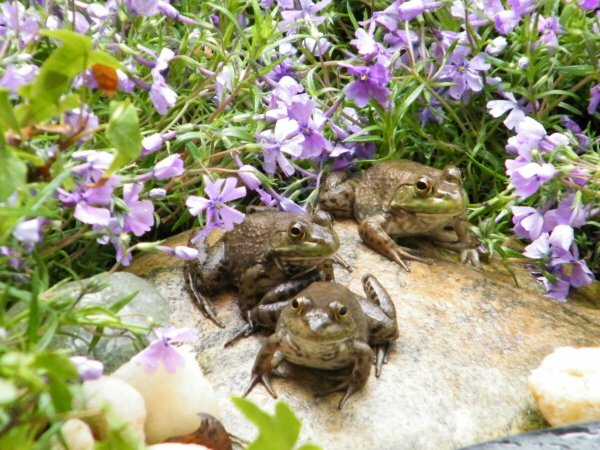 Chuck sent me these three bullfrog photos on 6/15/04: Bullfrog, two bullfrogs, and bullfrog. Ray sent this link to a photo on 6/12/06 of a fat bullfrog with an unusual yellow color that he took a photo of: Male yellow bullfrog. 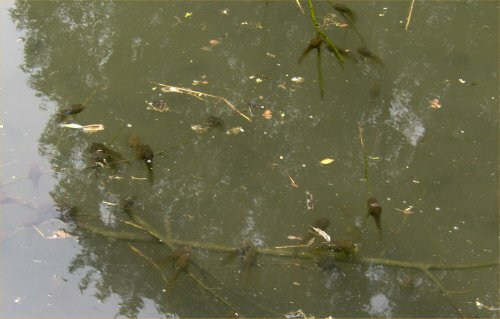 I took these photos at the zoo on 6/7/06 of a ton of huge bullfrog tadpoles in a stagnant sort of pond on the property. 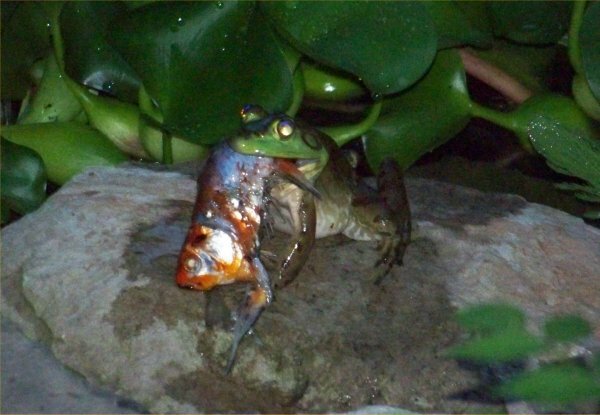 Laurie sent this photo of a bullfrog with a goldfish in its mouth on 6/13/06. She said he eventually spit it out since it was too big. I am not sure why the date on the photo says 1/15/03. 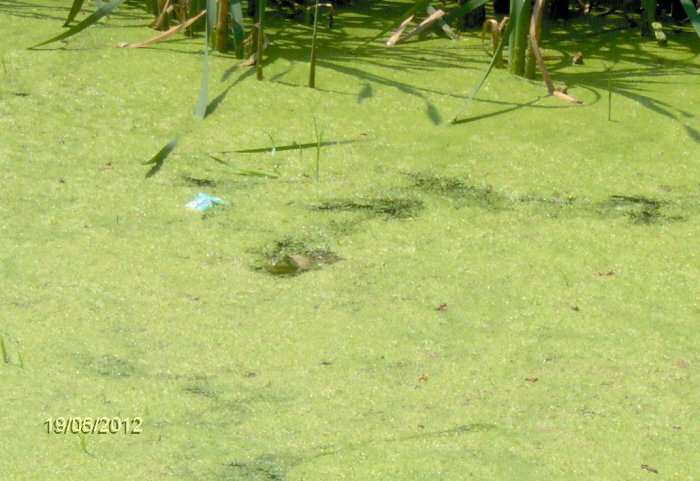 Chuck sent these photos of a female bullfrog on 9/4/06. 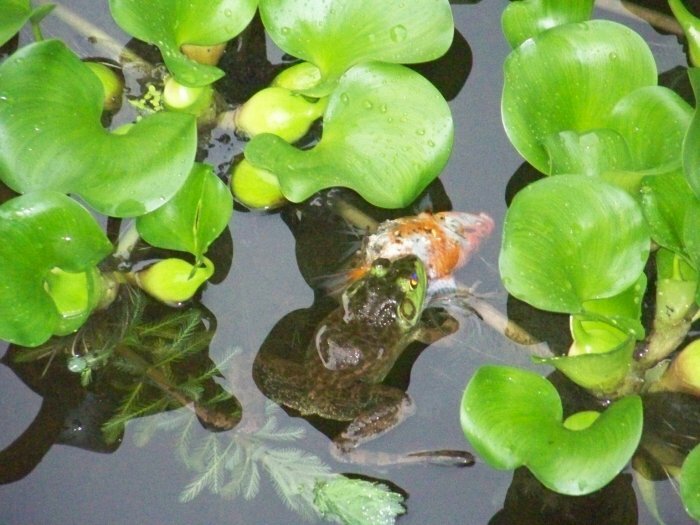 On 7/12/08, David sent these photos of a bullfrog eating a shubunkin goldfish (or maybe a calico fantail) in his pond among the water hyacinth. 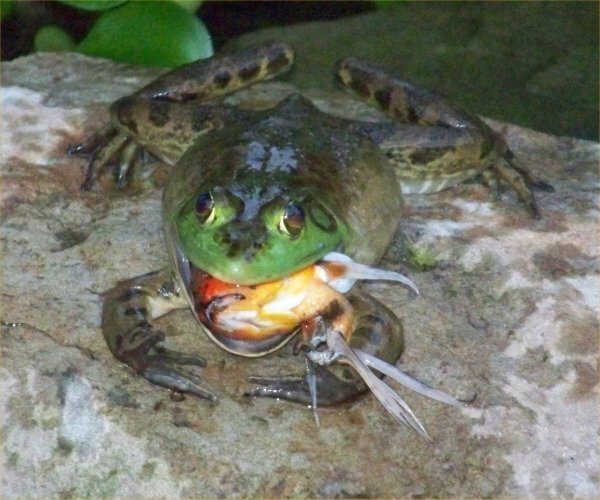 On 9/28/08, Carol sent this photo of a proud bullfrog consuming a poor bird. The bullfrog's name is Budweiser. 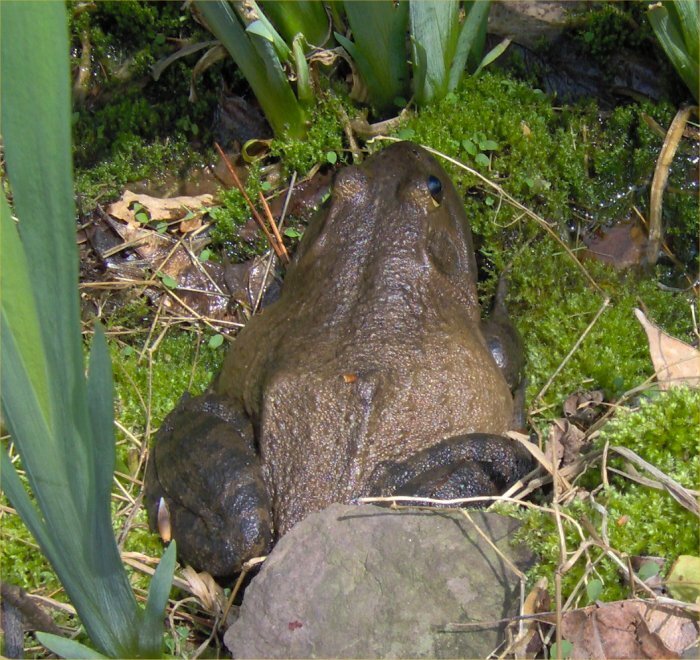 On 5/11/09, the same Phillip sent a photo of his frog. It looks to be a female bullfrog. 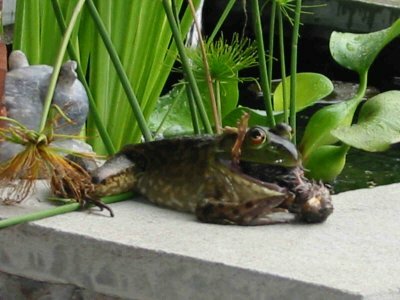 Marianne sent these two photos of a bullfrog named Carl eating a sparrow (bird) on 9/1/09. "He attacked the sparrow, then dove to the bottom of the pond and drowned it. He resurfaced and then took almost two hours to swallow the bird." 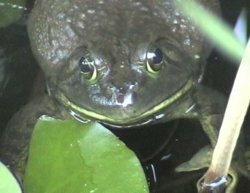 Angie sent this photo on 5/25/10 of a female bullfrog with interesting jet black eyes. 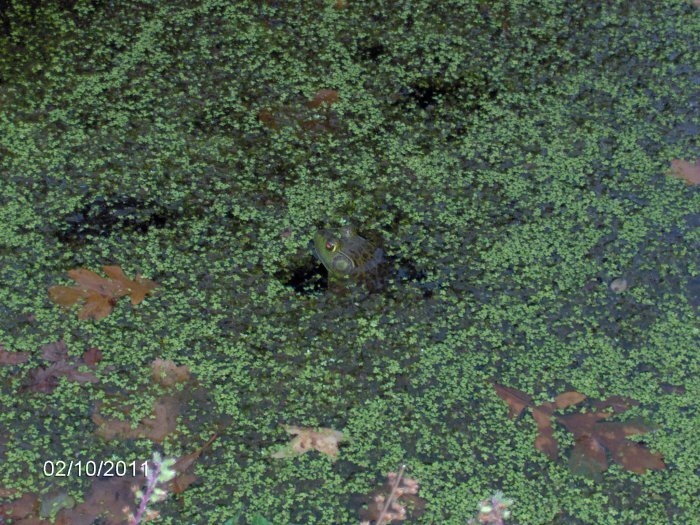 Bullfrog in a pond surrounded by duckweed. Bullfrog at a pond at the Baltimore Zoo on 6/19/12. The pond is covered in duckweed. Bullfrog - close-up of the last photo. 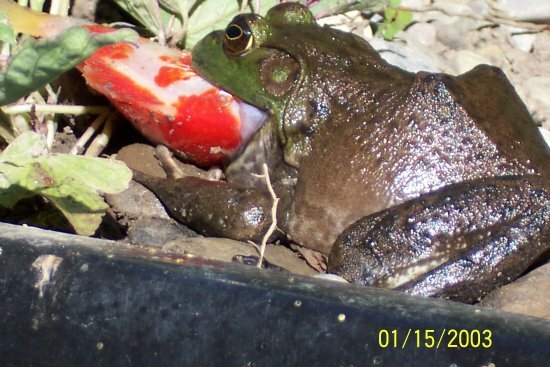 Carol (the same one as above) sent me these photos of a bullfrog eating songbirds on 1/23/12. The photos were taken years ago. These links were last checked on 5/25/10. 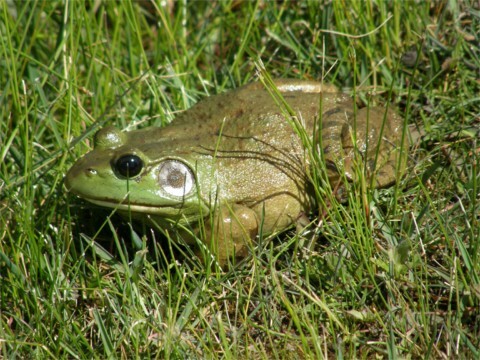 To see a photo of the bullfrog, hear a call, and get some info, go to this frog site . 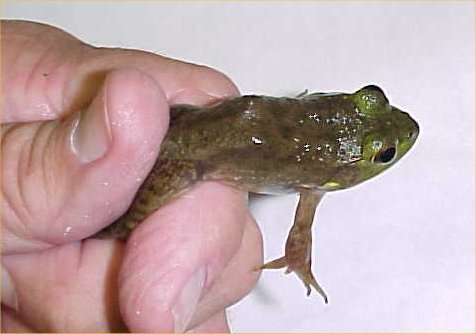 The Herps of Texas web site has a photo, call, and information on the bullfrog as well. There is a photo and call at this site.